The Wild Sheep Society of British Columbia thanks our Monarch Members for elevating us to new heights. As a Monarch Member you are eligible for elevated benefits including designating how your contributed funds will be directed. JOIN TODAY! In 2018 we introduced our Monarch Membership and we are excited to welcome our MONARCH MEMBERS. Thank you for your conservation efforts and for GIVING BACK to wild sheep in British Columbia. The Monarch Membership takes the exceptional commitment of our Life Members to the next level. Monarch Members receive special gifts to recognize their dedication to the Wild Sheep Society of BC. All monarch members will have the opportunity to designate where they would like their Monarch Membership funds allocated. We are able to offer six current areas where membership dollars are spent which include: Northern Burn Project, Southern Burn Project, Disease Related Projects, Life Membership Fund, Society General Revenues, and Hunter Heritage. Monarch Members will have a direct say in our wild sheep conservation projects. Your choice of a SITKA Gear Jetstream Jacket embroidered with our Monarch Logo or a YETI cooler emblazoned with our WSSBC Logo. Any Monarch Members receives two free tickets for the convention’s Life Member hunt drawing (when offered and if in attendance). The Silver Monarch Belt Buckle engraved with our Monarch Logo professionally designed by Troy Fischer Silverworks (Professional Buckle Maker). Silver Monarch Members receives three free tickets for the convention’s Life Member hunt drawing (when offered and if in attendance). The Gold Monarch Belt Buckle engraved with our Monarch Logo professionally designed by Troy Fischer Silverworks (Professional Buckle Maker). Gold Monarch Members receives five free tickets for the convention’s Life Member hunt drawing (when offered and if in attendance). The Platinum Monarch Knife engraved with our Monarch Logo professionally designed. Platinum Monarch Members receives ten free tickets for the convention’s Life Member hunt drawing (when offered and if in attendance). Monarch members will be recognized on our website and in our quarterly magazine. Monarch Members will also be honoured at the annual Southern and Northern Fundraiser. We do at least one yearly drawing to honour our Monarchs. To be elevated to the Monarch level a $1500 contribution is required. However, members can choose to work their way to the Silver Buckle and ultimately the Gold Buckle level. Contributions are recognized throughout the lifetime of that member. As an example, if an individual elected to become a Monarch member they would contribute $1500. In two years time they could contribute an additional $3500 to achieve Silver Monarch level. At a later date $5000 would elevate the member to Gold status. The following payment plans are available however we can customize a payment schedule for you. Please call 250 961-1908 for details. Monarch Members ($1,500 minimum contribution) – 12 Monthly payments of $130. Platinum Monarch Members ($25,000 minimum contribution) – 60 monthly payment of $425. Why should I become a Monarch Member? Monarch Membership is a new exciting program that offers dedicated wild sheep conservation enthusiasts an opportunity to become more involved. 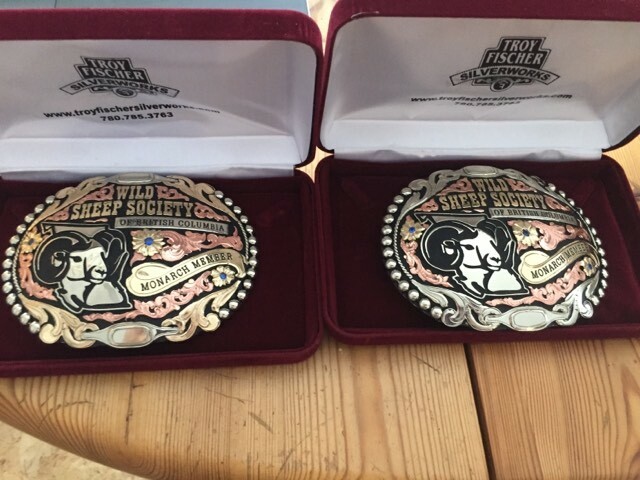 Wild Sheep Society of BC Members are incredibly passionate about our natural resource and this is a chance for those individuals to take their support to the next level. Monarch status offers an exclusive membership reserved for those that want to GIVE BACK to wild sheep conservation in BC. Is there a number system for Monarch Members like our Life Member numbers? Yes, we will create a new and exclusive list for Monarch Members. Numbering will commence at number 1 and will be issued by first come first serve. Are there different numbers for each level of Monarch Membership? No. Once you join the ranks of the Monarch Membership you are a Monarch regardless of your level. This is why the base level is simply Monarch. As you work toward your Silver Buckle and Gold Buckle Levels the benefits change, however your number does not. Our Monarchs, whether at the base level or through to Gold, receive special recognition due to their high level of commitment and desire to elevate their commitment to GIVING BACK. This is the basis of our new Monarch Membership program and why we offer a unique opportunity to designate where your Monarch funds are being spent. Do I really have a say where my Monarch Membership Contribution is being spent? Yes. We currently offer six areas where you are able to designate your Membership dollars. This is the very heart of our Monarch Membership is recognizing your involvement and letting YOU have a say where your money should be spent. We have heard from members that they would like to see money spent on various projects. Monarch Membership offers you the ability to have that voice. With that in mind, our list of areas where you would like to designate your investment may change from time to time. As an example in the future we may offer transplant programs where funds can be allocated. At this time we do not offer that option as transplants are not a possible project due to disease related issues in the province. If you designate an area for your Monarch dollars we will direct those funds to that project. Recognize however that we need to have a project planned for that area you have designated. With our current list we have all of those projects designated for the coming year and as such your money will go to those projects. If however, for some reason one of the items ceases to be an option we will hold your funds in our account until a time when we do pursue that project. Basically understand, as an example, that if you designate your Monarch Gold Membership to a Northern Burn and we do not have a burn planned we will hold those funds until we do. You have OTHER listed as an option for funds allocation. What does that mean? If you have a specific project or area you wish your Monarch Membership dollars to be allocated you can write down that request. We do caution however that we have to offer that project if you are designating something specific. As mentioned earlier if you state you wish to put your money into transplants, we cannot conduct transplants in BC at this time due to disease related issues. We will hold those funds in our account until such time that we are able to offer that project. However, if after five years of you signing up as a Monarch Member if we do not offer that project we then have the ability to utilize those funds for a current conservation project. What happens if on the payment plan I stop paying? Monarch Members must remain in good standing. If they fail to make the requisite payment under the agreed upon plan we have the right to cancel or suspend your Monarch Membership. Can only Life Members apply for Monarch Membership? If so, why? Yes, you must be a Life Member to apply for Monarch Membership. Our Life Members play an important role in our Society and we continue to honour their commitment. The money in our Life Membership fund is an important component, which helps us fund society related items such as the Wild Sheep Raffle, an important fundraiser for WSSBC. Without our Life Membership fund we could not financially back these raffles. If I am not a Life Member can I still become a Monarch Member? Yes, you can purchase a Life Membership and immediately join as a Monarch Member. Is Monarch Membership funds refundable? Do I get the Monarch Sitka Jacket/Yeti Cooler and Silver Buckle if I join Monarch Gold? Yes, you will receive all the benefits for each level. If you start off a Monarch Member you will get the jacket/cooler. If you start off Silver you will get the jacket/cooler and Silver Buckle. Monarch Gold Members receive all three immediately. The program is tiered so that you can start off and work your way up through Silver and Gold based on a cumulative lifetime contribution or you can simply go straight to Monarch Silver or Gold. Will you offer higher levels of the Monarch Membership? We currently do not offer anything higher than Monarch Platinum however we do envision in the future that some individuals may wish to make higher-level contributions and see a higher Monarch Membership offered. Our intention is to offer this program with Platinum as the highest level, however if there is interest in a further tier we will offer it at a later date. We wish to thank all of our valued members for their continued support and contribution to wild sheep conservation efforts. All of our members are incredibly important to contributing to Keeping Wild Sheep on the Mountain. We offer the Monarch Membership as an opportunity for those individuals that wish to GIVE BACK and we wish to recognize them for that. We feel our Monarch Members will have an opportunity to take wild sheep conservation to a whole new level in British Columbia. Come and join the Monarch Membership today.